There are 101 recipes in the book with options for vegan, vegetarian, paleo-friendly and gluten free diets. All are clearly labelled at the top of the page with either V, VG, PF, GF or a combination thereof. The cookbook has a neat layout, nice design, and beautiful pictures of each completed recipe. The recipes are easy to make and will appeal to anyone looking to eat healthy. Recipes like Chicken Noodle Soup, Easy Pizza, Raspberry Filled Cookie Bites, and Mexican Taco Meat aren’t likely to scare away people who have never been “healthy” eaters. Simple but extremely useful kitchen tips for those who are new to making healthier food choices. Fantastic Sauces and Dressings Section. Container measurements so you can easily incorporate the recipes into the 21 Day Fix program, as well as complete nutritional information if you are doing your own thing. The beginning of the book has some interesting personal info about Autumn, and while normally I might find this annoying in a cookbook, I found it rather interesting and fun to read. Autumn is a genuine and likable person, who is never condescending or holier than thou in her wording and approach to healthy eating. Autumn quickly corrected any Nutritional information mistakes found in the book with this updated list in .pdf format. I wasn’t too happy to see recipes that had dairy and soy as part of the ingredient list. That being said, there weren’t a lot of them and dairy ingredients can always be substituted with non-dairy ones. On page 22, Autumn explains why she included these ingredients in her cookbook. Several recipes in the book include her grandmas homemade tomato sauce (page 81) to be made from scratch. The truth is, any organic tomato sauce brand will do and be less of a hassle. The recipe itself was fine, but not so extraordinary that it needed to be included as part of a few recipes. Some recipes are too simple, to the point of being ridiculous. Tuna salad scooped into a tomato, Poached egg on a slice of toast with a layer of steamed asparagus or Spreading hummus on a sliced cucumber and rolling it up with sliced red peppers …… Do we really need instructions on how to make any of that? I suppose if you’ve never stepped foot into a kitchen or really can’t think outside the box, those recipes will be helpful but I felt it was completely unnecessary. 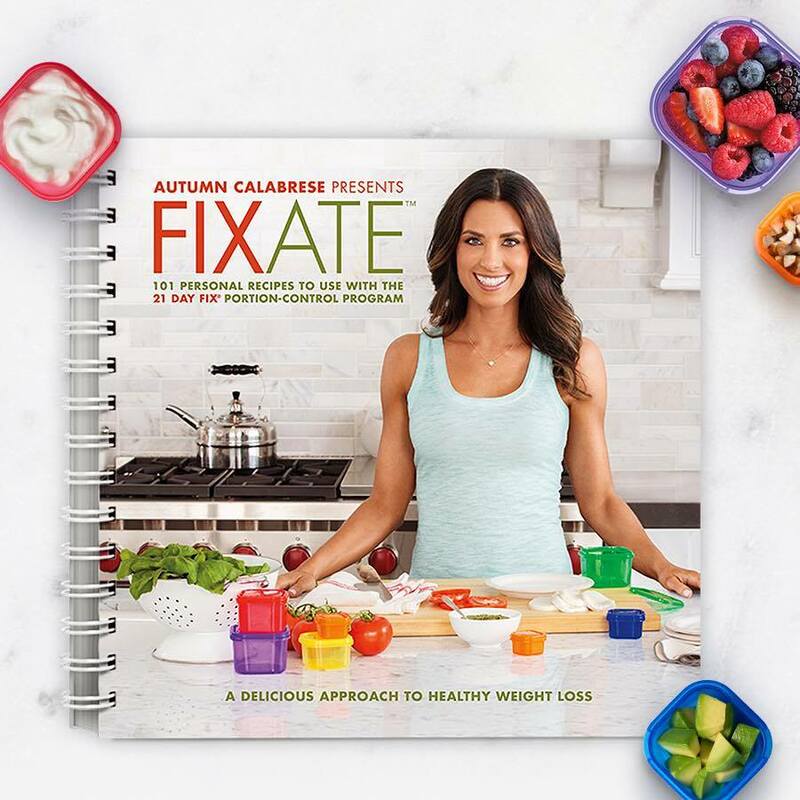 Fixate is not a cookbook with recipes that will make you “ooh” and “aah” over all the amazing food but what it does have is healthy, doable and tasty recipes with a clear indication of portions per recipe using Autumn’s 21 Day Fix Food Containers. Incidentally, if you don’t want to do the fitness program, but are interested in the cookbook, you can purchase the containers separately HERE. Overall, I would say for the $20 it’s a worthwhile purchase, especially if you are following the program and need new ideas. On the other hand, if you are an experienced healthy eater it might not be worth it for you. Recipes I particularly enjoy and make often are the: Quinoa and bean salad (page 63), Toasted kale salad (page 69), Banana oat pancakes (page 95), Vegetable egg cups (page 119), Italian meatballs (page 153), Turkey sloppy joes (page 171), Zuchinni chips (page 203) and Chocolate chip cookies (page 211). I haven’t made nearly all the recipes, so I am sure there will more to add to the list at a later date. Share below what you like or dislike about the cookbook; I would love to read your comments and opinions.